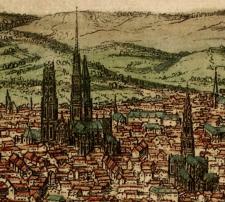 Rouen, Georg Braun, Frans Hogenberg 1616? Rouen Valegio Francesco, 1625 ? Former center of the Rotomagi; invaded by Normans 9th cen. ; occupied by England 1418-1449; site of trial & execution of Joan of Arc 1431; taken by Huguenots 1562; held by Germany 1870; site of famous 13th-cen. Gothic cathedral damaged in World War II.